It has been so long since I've done a Wedding Belles post, but I've gotten a ton of questions about our honeymoon and so I thought I would share some tips. The first thing you and your fiance' should discuss is your budget. A lot about a honeymoon can change depending on whether your budget is $2,000 or $10,000. A great way to help stretch your budget is to set aside a fund as soon as you get engaged and try to stick money from both of your paychecks back into that fund. I know this can be difficult because you're probably trying to pay for your upcoming wedding as well as everyday stuff, but you just have to prioritize! Another way you can save for your honeymoon is to ask your friends and family to give cash, which you can put toward your trip or you could even sign up for Honeyfund, which is a way for people to contribute to your honeymoon fund as your wedding gifts without having to ask for cash. Chris and I took every cash or check gift that we received and stuck them back to use as spending money on our trip. We were so thankful for everyone who gave to us and we enjoyed many wonderful meals and so many fun nights out because of our friends and family. And don't forget, your budget needs to include things like buying groceries while you're there, any shopping you'll want to do, excursions (Chris and I did a ghost tour and two carriage rides), gas money (if you're driving! ), and money for going out to eat! Once you've decided on a budget together, then you can start working on a location. There are a ton of places to choose from within the continental U.S. and even more outside of it. The obvious locations are the beach, mountains, etc. Make sure to consider whether you need a passport or if you're going to have to fly or drive to your location. Make sure that both of you are in agreement, since it is a trip to celebrate the both of you! Chris and I monopolized on our location, taking a trip to Savannah and staying there and then road-tripping to Charleston, South Carolina as well as Tybee Island, GA. The budget can be a deciding factor in the length of your trip, but other than that you'll need to look at work schedules, vacation days, and if you both have anything already scheduled. Chris and I chose to go on a trip closer to home (Savannah, GA) and to go for a week. It was less expensive and allowed us to stay gone longer than a tropical honeymoon. 4) Where will you stay? Your honeymoon is one of the most important trips you'll take, so you want to be comfortable and you want where you'll stay to be your style. If you're more into modern details, an upscale hotel might be more your style. But if you like a more relaxed, rustic style a bed and breakfast might be more comfortable for you. When Chris and I went to Savannah, we had thought we would stay at a B&B first. Then after looking around, we found an adorable historic home that had a private basement apartment. It ended up being perfect for us and really nice. It had a private kitchen, bathroom, master bedroom, and living area. It was centrally located and very comfortable! 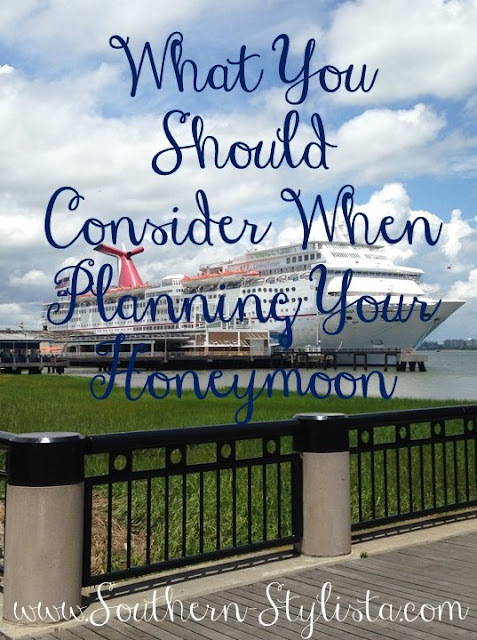 You want to make sure that you plan your honeymoon in a time of year where you can enjoy your destination. Make sure that you're not traveling to a tropical location during hurricane season, or to a ski resort during summer time when there isn't snow on the ground. But you also need to think about trying an off-season because it will be less expensive. An example of that would be going to the beach right as school is starting back. The temperatures are still comfortable, all the stores & restaurants are still open, but rooms are sometimes down to half price! Above all, enjoy yourself. Your honeymoon is about celebrating the fact that you're a new couple. This time should be spent having fun and enjoying each others company. It'll pass by entirely too fast, so soak up every single moment! Budgets are SO important! :) Great post + tips, lady! Love this!! :) we went to the Dominican for our honeymoon and stayed at an all inclusive resort and it wasn't too bad! Great tips! I want to go on another honeymoon!! We did St. Lucia, Martinique, and Antigua. Seriously it was hands down the most amazing trip we've ever taken. I'm so glad we took the time to do it. This is a great advice. Thank you of sharing! We love Savannah and we can't wait to get back there. The Dominican Republic sounds amazing! I hope that my husband and I can keep going on fun trips like that! My husband and I have been married for three years and have yet to go on a honeymoon. LOL! My parents have been married for thirty and still haven't taken one...they say they're saving up...I guess they're going to go on a reallllly good one lol!